Hot deals on 59-plate cars | What Car? There's still time to enjoy some top-down motoring and Audi's stylish new A5 Cabriolet might just be the one for you especially when you see what deals are available. 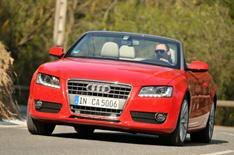 Coast2coastcars.co.uk can save you 2558 on the list price of a 2.0 TFSI model, dropping it to 27,242. The Ford Kuga's mix of sharp styling and affordable running costs has made it one of the best-selling SUVs. Healthy discounts on the list price have helped, too, and here's a particularly juicy one a 4729 saving on the list price of the 2.0 TDCi Titanium 2WD model at Drivethedeal.com. That means you get an SUV loaded with standard kit for just 17,716. Land Rover's revitalised range looks in great shape and CO2 emissions have been cut across the range. The baby of the family the Freelander is cleaner thanks to a new engine start-stop system and discounts help to lower running costs further. Head to Motorlogix.com for a 3263 saving on the list price for the Freelander 2.2 TD4e GS, dropping the price to 21,262. In the current financial climate, superminis make more sense than ever, especially when many now come with the creature comforts you expect in much larger cars. Renault's smart new Clio, for example, is available with an affordable sat-nav system and you can already find useful savings on the list price. Go to Uknewcars.co.uk for a discount of 2602 on the list price. That's a healthy chunk and cuts the price you pay to 11,078. If that's still a bit too much, then how about a classy supermini for less than 10,000? Thanks to a 2011 saving on the list price, you can get the Skoda Fabia 1.4 3 at Drivethedeal.com for just 9994. For all our new car deals, go to our New Cars For Sale section.